Will the government restart plotlands? Housing will bring in a form of plotland development. Will it deliver affordability and sustainability? Can we avoid the motorists? I grew up in Kent in a house built by my father on a plot of land bought as a wedding present. 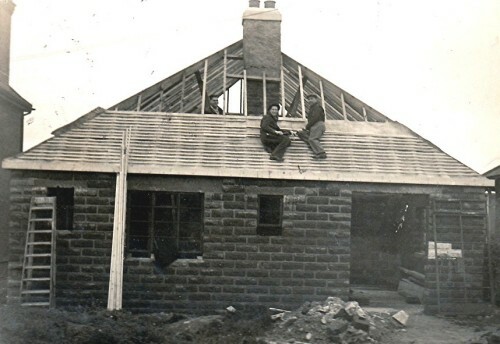 My parents were married just before the World War II so building did not start until 1946. Its construction was not what you would see today. The “bricks” were very heavy concrete and cinder blocks. They were in a figure of eight. They had two vertical holes. I remember my father showing me the machine that made the blocks. It was rather like the Wizard Block Making Unit described by Preservation in Action. It had other odd features like very hard floors containing sawdust. It was a Magnesium Oxychloride Composition Floor. My father altered the internal walls from time to time. 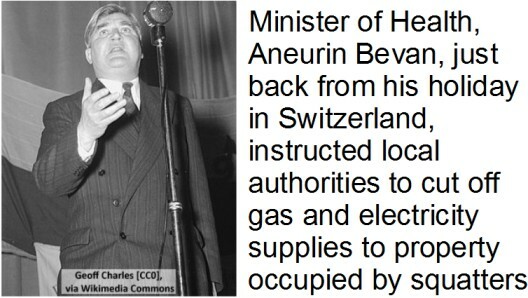 I particularly remember that he mended a bathroom tap through a hole he made in my bedroom wall. He filled the hole in a year later – after moving a wardrobe to hide it – temporally. We had a long garden with several old trees from the farmer’s orchard that existed before the land had been divided into plots and did have fresh fruit and garden-grown vegetables to eat. In my youth, just a feww neighbours had cars but buses ran past every 15 minutes from 5.30 am until 11pm – the pubs then shut at 10pm. That was good because it was a steep climb up the hill from the local town. “Karen Guthrie and Nina Pope’s new documentary, Jaywick Escapes, paints a picture of a town still seen as a refuge for troubled Londoners but now seemingly abandoned by the government, the council – everyone except for its few thousand residents. I suppose that our family was a “hard working family”. My parents had just got through the war and it’s difficult aftermath. Too much in retrospect, I am very grateful to them for my upbringing, They hid many of their difficulties. It is perhaps a distant memory of “hard working” people having the freedom to build to their own houses that encourages politicians to think about plotlands again. After 1947, any land would be purchased by a developer at its existing-use value and a “development charge” levied on the difference between the initial price and the final value of the land. The 1947 Labour Government didn’t like people stepped outside the planning system as Colin Ward pointed out in The Hidden History of Housing. Of course, “the planners have been in charge since 1947” is a simplification. Power in planning is split between several bodies, statutory planning bodies, the courts, and ultimately the Government who give guidance to planning authorities and can call in plans for the Secretary of State to determine. However, it is widely recognised that planning processes (shortform: “the planners”) have had the effect of limiting what a land owner can build. In practice, this has resulted in restricting the amount of building and increasing the price of housing. Since anything but trivial development must have planning permission, the development value can be recognised as the value of planning permission. The unimproved value land is a tiny part of the costs. In 2016, a plot of land big enough for a house costs £500 at agricultural prices. In places like York, that becomes £50,000 or more once the planners give building the go ahead. In the London catchment area the value of a housing plot with planning permission exceeds £100,000. Planning permission makes no immediate difference to the land: but its name on a certificate in a council office gives an enormous unearned bonus to the land owner. Local plans can give enormous wealth to land owners. The 2014 draft local plan for York proposed housing developments, with more than 22,000 houses, potentially giving away over a £1 billion. That is more than £5,000 for every person in York. KPMG reported that each year, the total number of households who need a home in England grows by around 250,000. They point out that the failure of housing supply to meet demand has increased house prices and rents. Terrie Alafat, the Chief Executive at the Chartered Institute of Housing. Andy Gray, recently the Managing Director of Mortgage Lending at Barclays Bank. A quick glance at the backgrounds of the panel, suggest that this review will not recommend anything like the affordable, sustainable starter homes we advocate. A previous review was by one of the members of the panel, Kate Barker. She was appointed by the Labour Government in April 2003 to conduct a Review of UK Housing Supply. Table 2.1 of the report contains an evaluation of the value to the public of different types of land. “Land on the edge of towns and cities” is what we call the “green belt”. It comes bottom of this list and gets less than a third of the votes given to “urban parks and playing fields”. The survey method – three votes for each respondent – blunted the earlier message that city parks were much much more valued than green belt land but the message remained “City parks good (very very good) green belt OK”. “Can brownfield land have a high ecological value? So building houses on brownfield land is bad if it destroys ecological value, ie “land with important or endangered wildlife” in the Ipsos MORI survey. Here is a question: When should brownfield land be turned into urban parks, leaving the potential brownfield housing being shifted to development to the green belt, “the land on the edge of towns and cities”? The evaluation in the Barker Review of Housing Supply and the subsequent Ipsos MORI survey suggests the public would very much prefer that brownfields should normally become urban parks even at the expense of building in the green belt. Once established parks from “brownfield land can be valued highly, for example, the Brickfields in Lower Halstow, Kent or St Nicholas Fields in York. “For the Nimbys, ‘brownfield sites’ is not just a land classification, but a mystical incantation. At CPRE (Campaign to Protect Rural England) meetings, they probably dance around a fire dressed up in tunics, chanting the words ‘brownfield sites’ and ‘urban regeneration’ to the beat of a drum. House price inflation has loaded enormous costs on the poor and the young and has been a bonanza for the affluent and the old. This realisation has had increasing coverage in the posh media. The coverage has greater emphasis on intergenerational effects rather than the effects on rich and poor because even the affluent classes are worried about housing for their children, who don’t want their children to rely on their parents. In order to get some idea of the different effects of the housing market on the affluent and the poor, I downloaded, house price data from the Land Registry for the years 2000 and 2010. I then looked at the changes in house prices for the most affluent areas compared to the least affluent areas. (I used the P2 People and Places Demographic Classification for this exercise). Adjusting for inflation between 2000 and 2010, I found that property of the most affluent areas increased by just over eight times the average income in 2010. Property prices in the least affluent are rose by a factor of two. However, according to the 20110 census, only 20% of households in the least affluent areas own their homes. In the most affluent areas this rises to 90%. Summary: House price inflation has given most households in the most affluent areas large increases in their net wealth, at the same time most households in the least affluent areas will have paid increased rents. “The overwhelming powers to control development given to planning authorities by the 1947 Town and Country Planning Act put an end to self-help house-building in Britain. Even self-build housing, which provides more homes than any of the multiple ‘volume house-builders’, has to produce a fully-finished, fully-serviced house right from the start. Designer Alastair Parvin presents a simple but provocative idea: what if, instead of architects creating buildings for those who can afford to commission them, regular citizens could design and build their own houses? The concept is at the heart of WikiHouse, an open source construction kit that means just about anyone can build a house, anywhere. Other new construction methods include factory made houses such as those planned by Legal and General: Houses made in factories from Cross Laminated Timber (CLT), which sounds like something we usually call plywood. Expect these to be sited on plots prepared for the purpose as the Government have signaled an interest in providing spaces for self-build and custom-build housing – a form of plotland development. Local authorities are now required to keep a register of people wanting plots to build for themselves of have houses built for them. How close this will be to what is wanted by “hard working families” in housing themselves with hard work and initiative remains to be seen. I suspect the interests of the outsiders who have been determined to do their own thing – despite the planning system – will not be top of the Government’s priorities. The signs are that that the Government will be reluctant to allow development on green belt land, loading the extra costs that brownfield development brings and plots ready to receive your house may be quite expensive. How much will plots cost? An article in the Architects Journal in 2014 described a pilot scheme on plots prepared by Carillion and gave projected costs as £50,000 for a plot and £120,000 for an entry-level house. What factors support the price of these plots? In the case of plots prepared by Carrillion, what are the preparation costs? Probably a small proportion of the £50,000 plot price. In the case of £200,000 open market cost, most of this will be the value of the planning permission certificate. These prices are not suitable for people on low incomes, especially at a time when the value of their labour is falling due to globalisation and the robot revolution. The York Plotlands Association for sustainable and affordable housing. Sadly what are considered the best “sustainable and affordable” modern developments are unsustainable and unaffordable. For example, Dewenthorpe billed as “affordable and sustainable” has houses that cost £300,000 to £500,000 and has residents with an average carbon footprint higher than the average in the rest of York. Can plotlands development, which was more-or-less banned by the 1947 Planning Act be resurrected to overcome the housing crisis and produce really sustainable and affordable homes and neighbourhoods? The York Plotlands Association is the first branch of the Sustainable Plotlands Association. In this context “sustainable” means living within our share of the worldwide remaining carbon budget (but more of sustainability in a future piece). We believe it is possible to provide starter homes for less than £20,000, a small fraction of the price of the Government’s “New plotlands”. This is both a call to stop the racket in planning permission (See York’s great £1 billion giveaway) and to begin an experiment in providing local facilities suitable for lifestyles that are pleasant, can (a) grapple with the economic problems of the robot revolution and (b) do not ruin our world. That may mean less work. It almost certainly means no cars. This almost certainly contrasts with the politicians vision of “hard working families”. Hard working families usually have enormous carbon footprints. The York Plotlands Association website starts with £20K housing – a lifestyle revolution. A plot of land big enough for a house costs roughly £500 at agricultural prices. In the York area, for example, a plot’s value becomes £50,000 once the planners’ give building the go ahead. There is no difference in the land: just its name on a certificate in a council office. This is an unearned bonus to the land owner, which starts the process of building expensive dwellings designed for unsustainable lifestyles. More often than not, new houses are built with little regard to public transport links or cycle routes to town and with little in the way of local facilities, such as corner shops or local greengrocers, home buyers are forced into un-affordable, car based lifestyles. York Plotlands believes that the cost of living can be greatly reduced loosening the hold the rat-race economy has over us, freeing us for simpler, pleasanter and more sustainable lives. The first step in our vision is low cost housing. Our aim is to reduce the price of starter homes to under under £20,000: a tenth of the average cost of housing in York today. 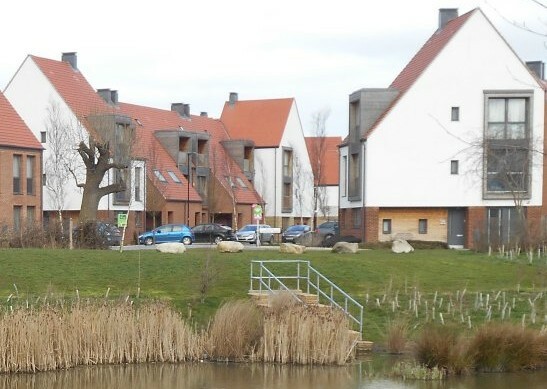 Conventional housing development perpetuates a car based society where neighbourhood facilities, such as local shops or bus services have little place. Construction with bricks and mortar causes enormous carbon emissions. We advocate siting affordable houses of modern sustainable wooden construction in pleasant semi-rural surroundings located near transport hubs and cycle routes. This will create a framework for affordable, sustainable living. — The York local plan is under consideration. — The Government have asked planning authorities to keep registers of people who want plots of land to build their own homes. — York is a pleasant compact city surrounded by agricultural land with a well developed cycle network with bus terminals on the periphery. So let’s sign up to book our place for a plot of land in York to build on and demand that this is provided at reasonable cost near routes with sustainable transport. Register for a sustainable plotlands build in York, the city council has provided a handy guide on how to proceed at York Council’s Self build and custom build housing. If you’re not a current resident sign anyway – York is rather a nice place to live. Let us know when you have done it on yorkplotlands@townplan.org or leave a comment here. We won’t succeed immediately but let’s campaign for £20,000 housing in communities that don’t ruin the world. In this country we can show the world this is possible and reverse the ecological disaster we started with the industrial revolution. 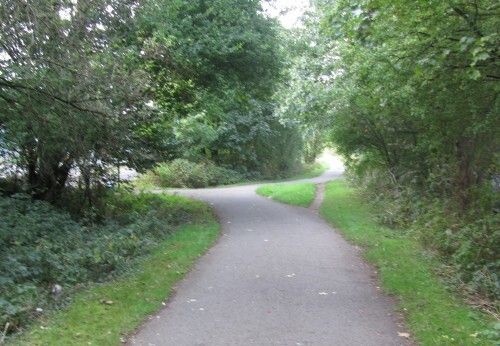 Sustainable plotlands: Exclusive to cyclists & pedestrians? I was going to wrap this piece up here with a few links to other articles. I hope there is enough above to point out the injustice of our planning system and how a new approach by this Government is an opportunity to push for a system that is fairer to the poor and the young. However, the biggest challenge the world faces, climate change, is only mentioned by implication. But first, a word on the role of the personal motor car. My childhood home has changed from plotland (but with a good bus service) to modern suburbia for people who are mostly motorists. It is not just the bus services that have (more or less) disappeared but so has the local shop, which is now a bungalow with a concrete standing for cars at the front. Life for those without a car will be difficult. (B) Car-free development should be the starting point for all development proposals in places that are (or are planned to be) well-connected by public transport, with developments elsewhere designed to provide the minimum necessary parking (‘car-lite’). In a press release London.gov explained “New housing and offices near public transport links to be required to be car-free”. The basic fact of dangerous climate change is this: To avoid dangerous climate change, the world’s population cannot aspire to the lifestyles of the affluent as they are now. Current affluent lifestyles create enormous levels of pollution and there is not enough time to engineer workable solutions and continue economic growth. Green Growth is impossible in the foreseeable future: it is impossible to have economic growth for the whole world and at the same time reduce pollution levels and keep within remaining carbon budgets. To save the planet, the answer to the question “Green Growth or Degrowth?” is “Degrowth”. We must find pleasant and desirable lifestyles in which people consume less and which that do not ruin the planet. OK Javid, where’s my plot! 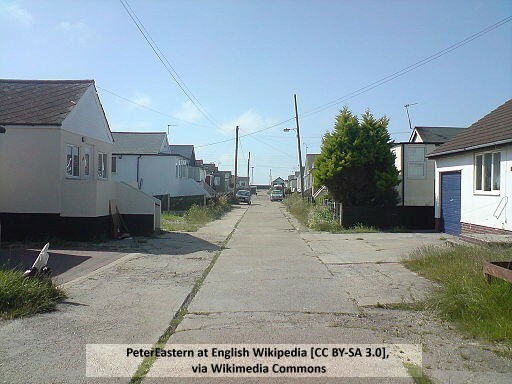 Hutters.uk: What went wrong with Jaywick? This is provides a very concise summery of essential information for those looking for i innovative solutions to ‘Housing Provision’. Ends with a brilliant proposal for £20,000 houses, if the interests of the Landowning class can be held in check! Needs to be widely read. No more new homes for motorists. Car-free estates of wooden prefabs with inbuilt market gardens. Are you evil or very evil? Climate change & the fallacy of the lump of labour fallacy. Censored by the Overseas Development Institute? Had we but world enough and time. Will the new government department sideline climate warnings? Can Richard Layard really be following Percy Bridgman? Green growth or degrowth ? Thomas Piketty or Robin Hood? Lionel Robbins didn’t understand science. Ravens do. Choose Venice over Los Angles – and save the world. Is the EV the car of the future? Will low paid workers pay the price for saving the planet? Is Green Growth a Fantasy?